This is a new pattern for Myron, and I love it! It is so striking and bold. The hand coiled jar, shows four stylized avanyu on the main body of the jar. Above it, around the neck is a black and white triangle pattern. 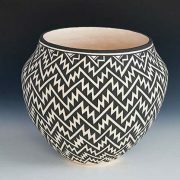 Below it is a fantastic combination of black and white geometric spirals and circles. 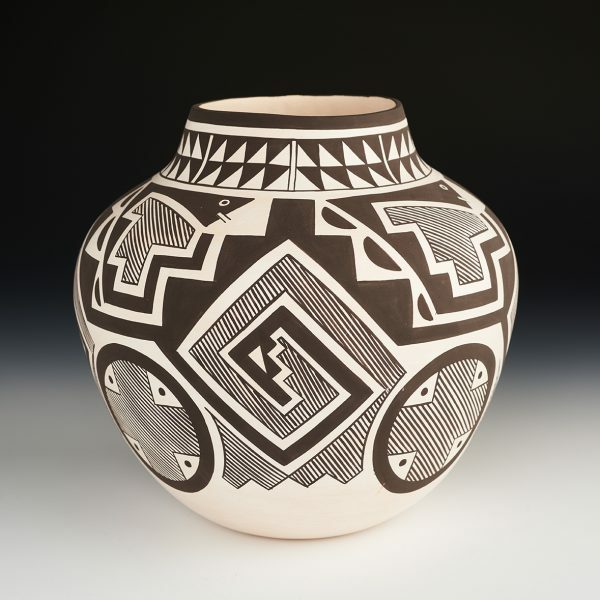 These geometric designs work so well with the linear depiction of the avanyus body. 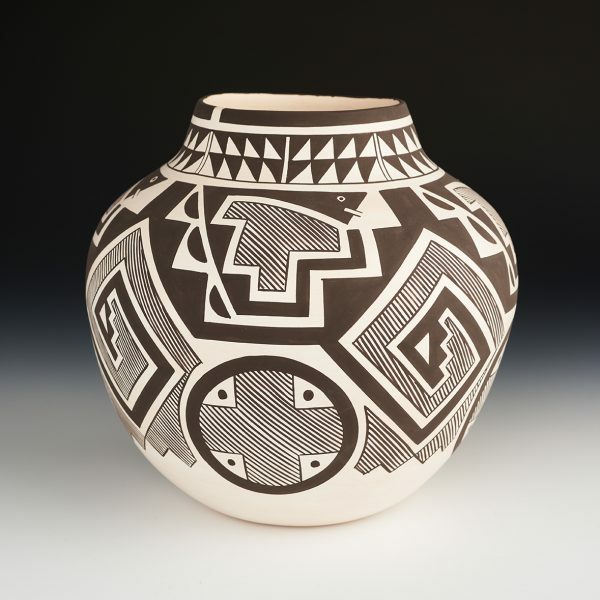 The entire painted areas fit so perfectly on the particular shape of this jar. It is really terrific. 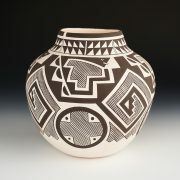 I am so impressed with Myron’s ability to take old style designs and make them his own in a contemporary style. Myron Sarracino, “Kaa Ooa Dinn Naa,” was born into the Laguna pueblo in 1967. 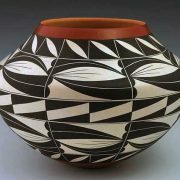 He began hand coiling pottery at the age of 17. He is one of the few Laguna potters working today. and his work is gaining notoriety. 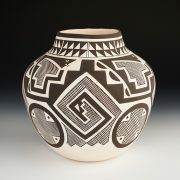 Taking primitive designs and adding his own stylized contemporary elements is his trademark. Leaning his pottery skills from our friend, Gladys Paquin, he continues to use traditional techniques in the forming of his clay work. 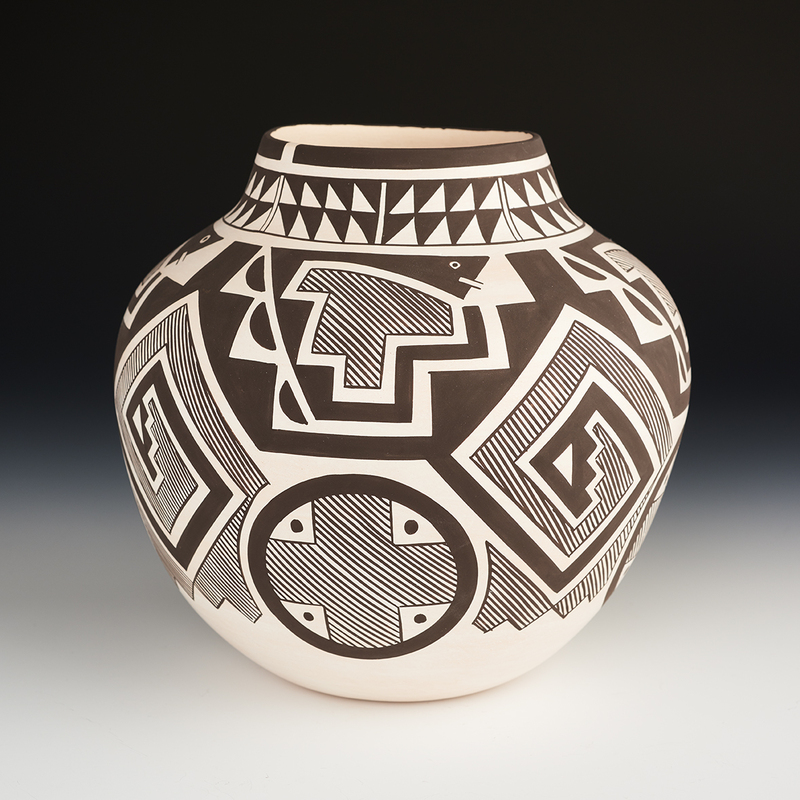 Most of Myron’s designs originated from the Tularosa basin in southern New Mexico.